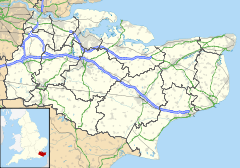 Eastry is a civil parish and remote, yet historically significant village in Kent, England, around 2 1⁄2 miles (4 km) southwest of Sandwich. It was voted "Kent Village of the Year 2005". The name is derived from the Anglo-Saxon Ēast-rige, meaning "eastern province" (c.f. Sūþ-rige "southern province"), also recorded as Ēastregē, from ēasterra gē (lit. "more easterly area"). Eastry lies on the Roman road north from Dover to Richborough Castle. It was here that a royal palace of the Saxon kings of Kent stood. One of Kent's oldest legends concerns King Ecgberht of Kent and the murder of his young cousins Æthelred and Æthelberht within the palace walls. According to the legend, the royal residence was passed to the priory of Christchurch in Canterbury as penance for the crime. The site of this ancient palace is believed to now be occupied by Eastry Court, close besides the church. Another traditional story is that Thomas Becket hid in Eastry's caves whilst escaping from England in 1164. Those same caves are associated with other stories that may or may not be true. Locally however it is said these tunnels were made in the first world war. Eastry's Grade I listed Anglican church is dedicated to St Mary the Virgin. Within the church is a brass standard bushel measure given in 1792. An electoral ward in the same name exists. This ward stretches south to Sutton, Kent with a total population taken at the 2011 census of 5,199. The East Kent Light Railway was opened to freight traffic in 1911 and passenger traffic in 1916. Its purpose was to serve the new coal mines which were being opened up in the area. Among the stations opened were 'Eastry' and 'Eastry South'. It was one of Colonel Stephens' lines, but was nationalized in 1948 becoming part of British Railways, Southern Region. Both the colliery and the line failed and the section north of Eythorne completely closed by 1951. The village is also on the Miner's Way Trail. The trail links up the coalfield parishes of East Kent. Eastry has had a number of windmills over the centuries. There were four mills marked on the 1819 - 1843 Ordnance Survey map, one of which, the Upper Mill, has been converted into a house. Currently there are three windmills in Eastry. ^ "Civil parish population 2011". Retrieved 3 October 2015. ^ Hasted, Edward (1800). "Parishes". The History and Topographical Survey of the County of Kent. 10. Institute of Historical Research. pp. 98–121. Retrieved 3 December 2013. ^ "Ward population 2011". Retrieved 3 October 2015. ^ "The History of the Coalfield Parishes". www.dover.gov.uk. Retrieved 20 November 2013. Wikimedia Commons has media related to Eastry.